Aloha, I am looking for my orange and white tabby cat please. I last saw him about 4.30pm on Mon 14th Jan. 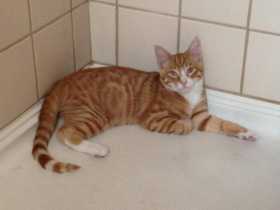 He has short hair, strong markings, and is a young cat. He’s friendly but might not come to anyone. He's a neutered male with no ear tip. He's quite nosy and likes other animals. So he may have wandered quite a distance. He’s my darling kid, so if anyone has seen him at all, please ring or text me. I would so appreciate it.